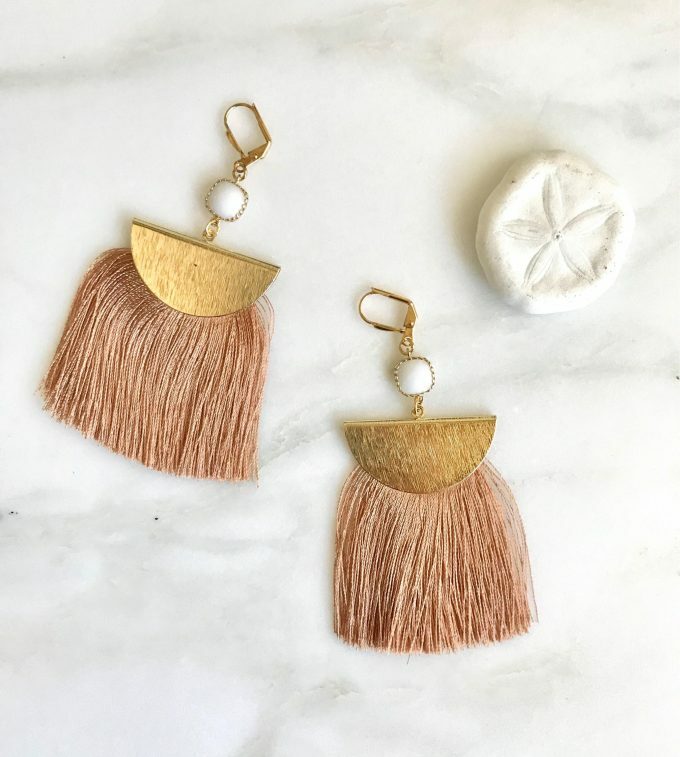 If you’re looking for the best tassel earrings Etsy or the internet offers, it can be quite the task. Emma here and why-oh-why does it take forever to find exactly what you want when it comes to accessories, especially online? 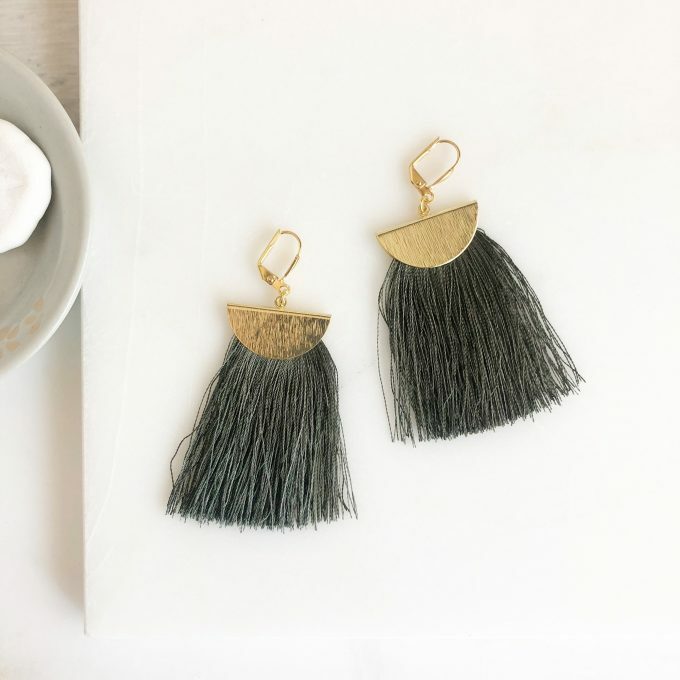 I could go on with the list of things, but today we’re tackling just one: tassel earrings. We admire the look of them, yet there are literally hundreds of kinds on the web. Where does one start?! I’ve got things to do! 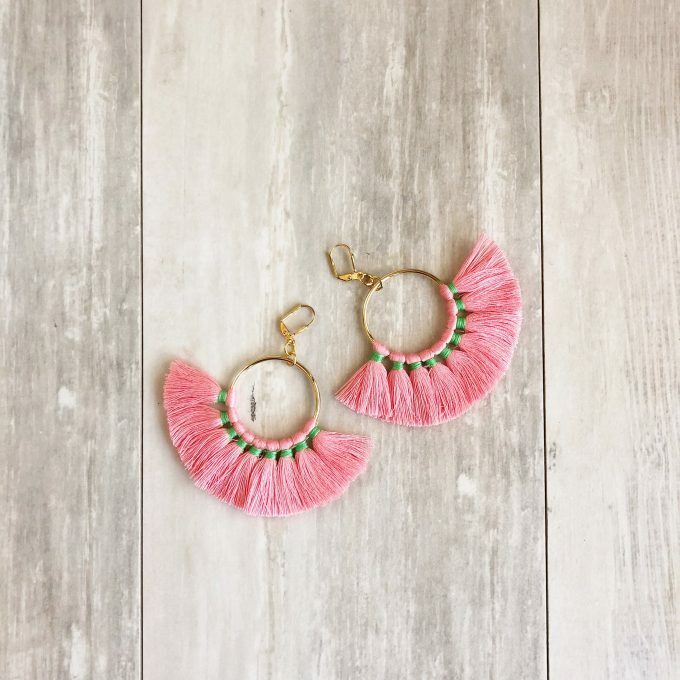 Yes, there are many tassel earrings Etsy offers, and online in general, but we’ve found the most beautiful — and affordable! — pairs from Rustic Gem Jewelry. You’ve seen Tracy’s gorgeous jewelry before (remember this?) 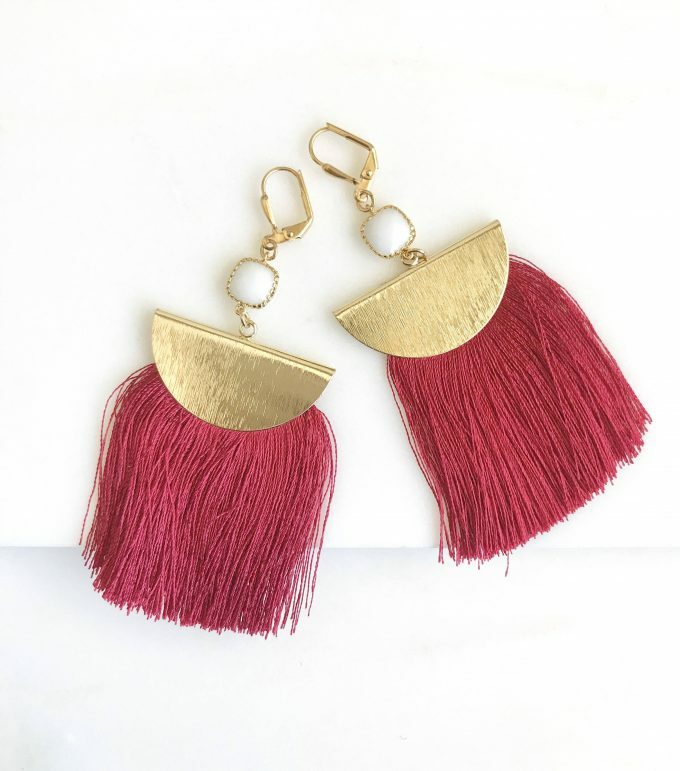 and we’re back to share the loveliest tassel earrings. 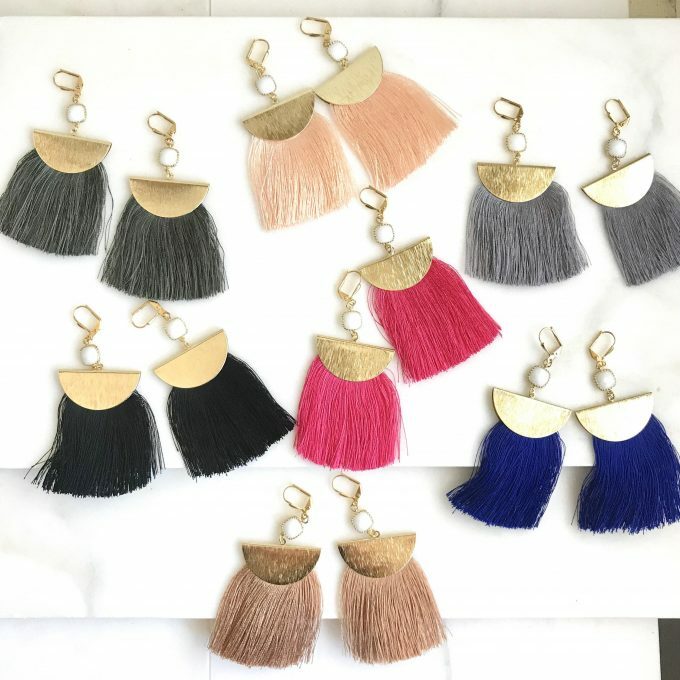 Normally one to jump in with two feet on most trends, I was initially on the fence about tassel or fringe earrings earlier this year. I thought tassels would never make a comeback, but they have; and after seeing these, I’m totally on-board with the trend. 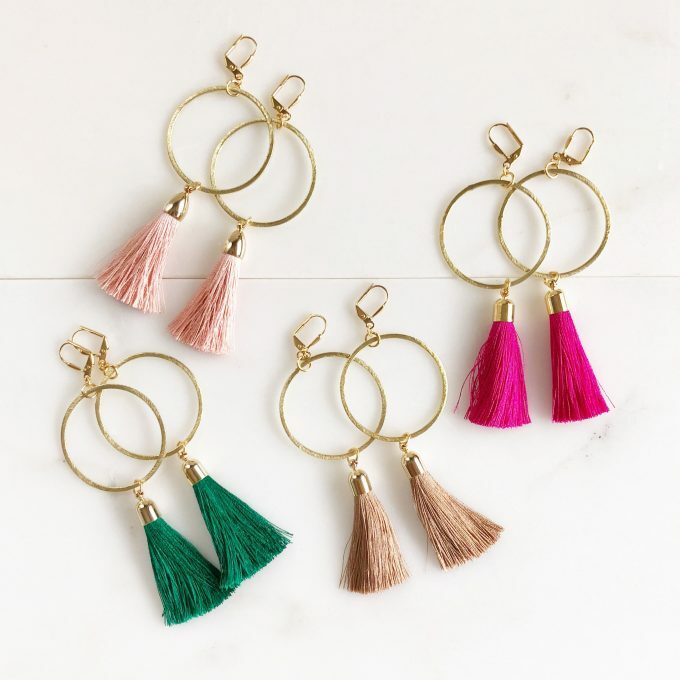 Tracy combines the elegance of a hoop with a dainty tassel to create a wear-with-everything earring everyone will love. 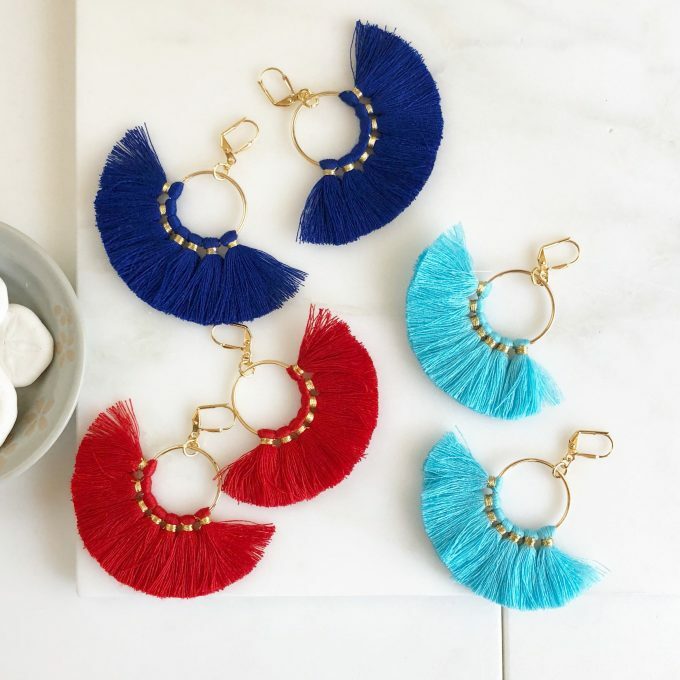 For more adventurous / bold fashionistas, opt for the fan tassel earrings. 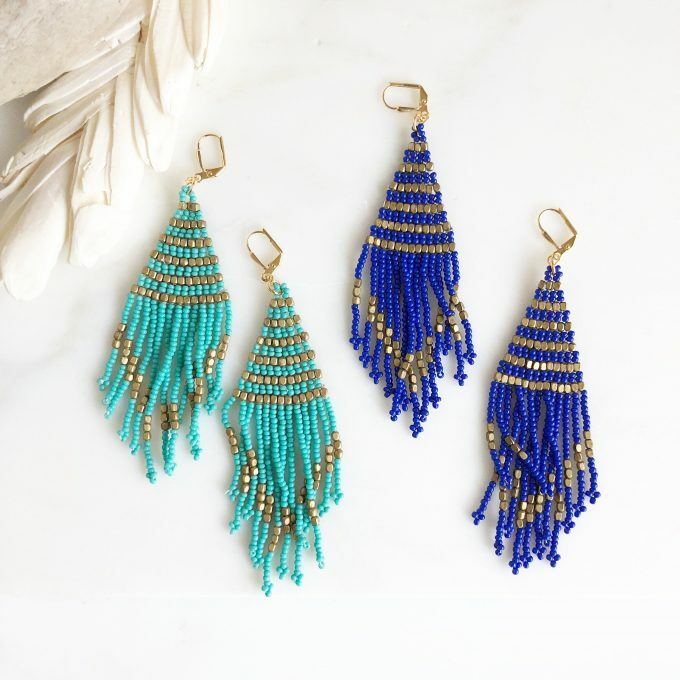 And if you want to take it one step further, go with the luxe beaded fringe earrings — they’re very glamorous. You’ll see them all in today’s blog post. 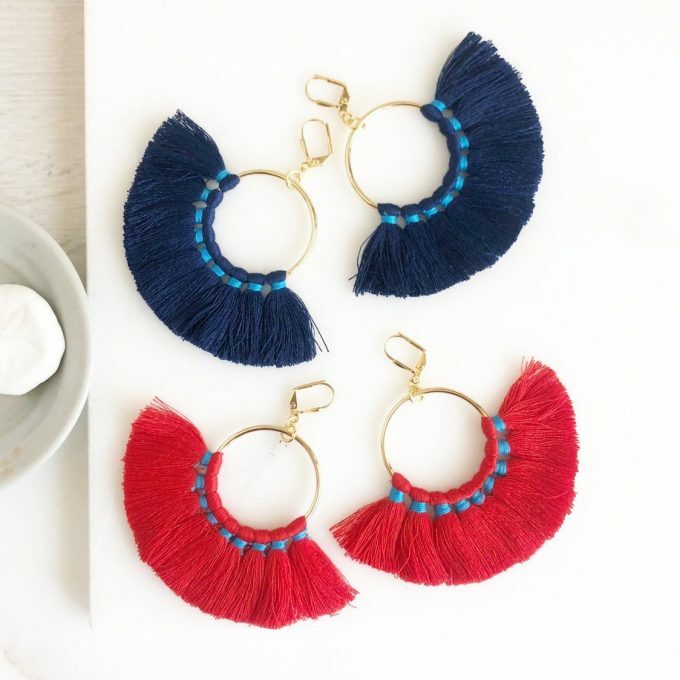 So, if you’re looking to buy tassel earrings for gifts or yourself, look no further: you’ll love the style and price of these beauties! 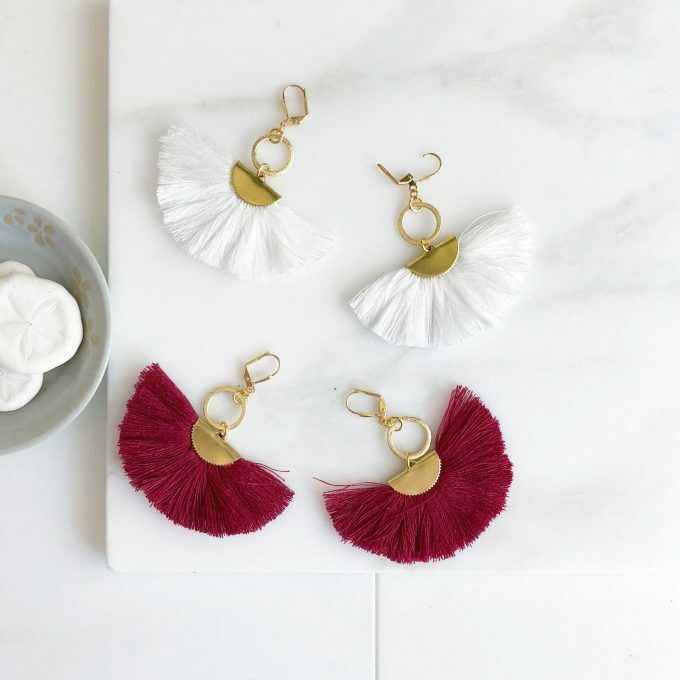 These earrings are inexpensive enough to gift to everyone in your bridal party (and your holiday list, like the deep red and gold tassel earrings you’ll see below). And, of course, there’s a pretty pair of white tassel earrings for the bride. :) Take a look! First, let’s take a look at traditional tassel earrings with a drop design set on a hoop. 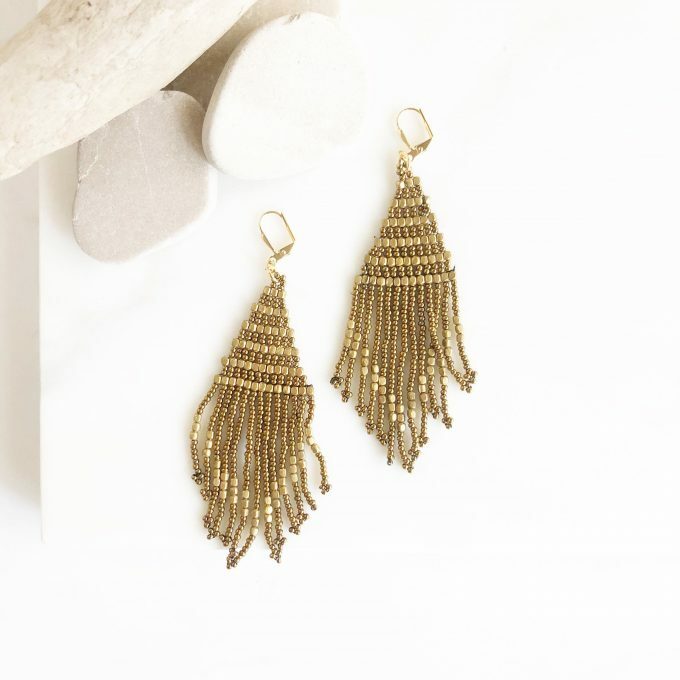 These gold hoop tassel earrings are my favorite; I love the length of the fringe; the hoops are gold plated and measure 40mm long. With these earrings, you can make a big + bold statement. I especially like the hot pink. 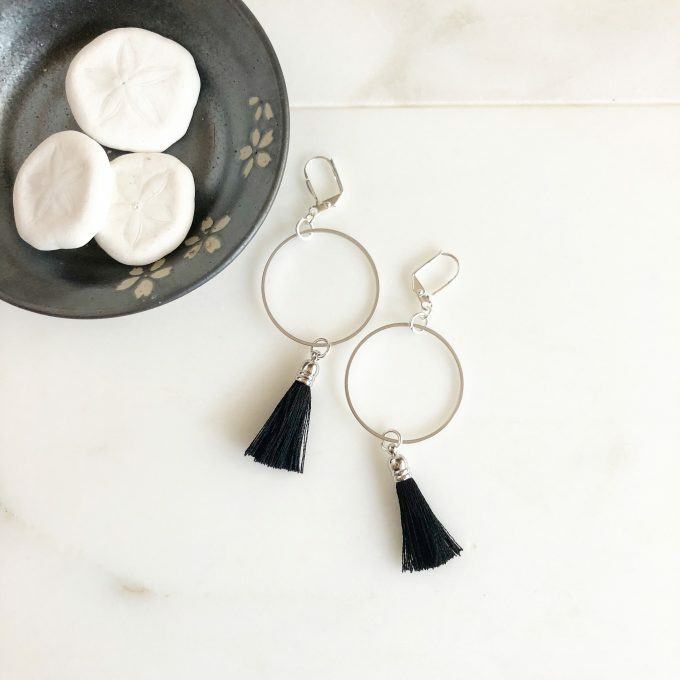 How about these black tassel earrings? They go with everything! 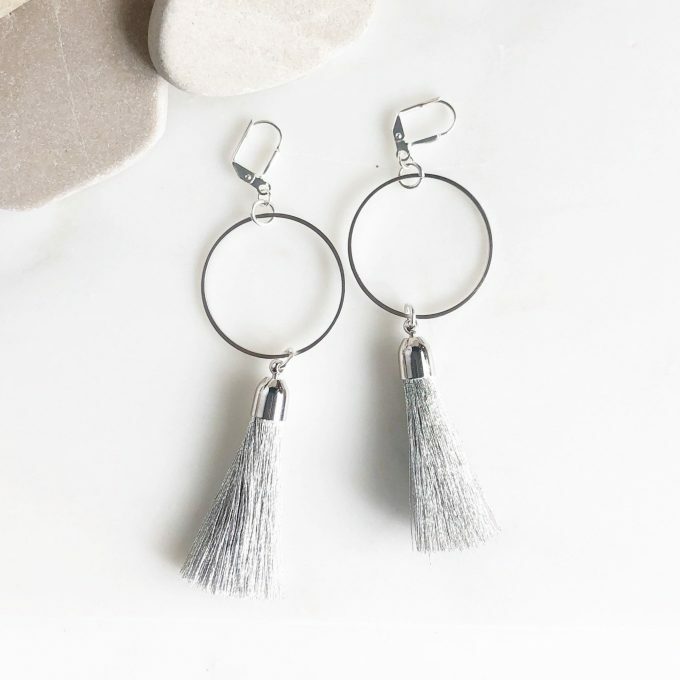 Similarly to the versatility of black tassel earrings are these silver ones, great for a night on the town! Here are additional colors that really caught my eye. It is impossible to pick a favorite color. 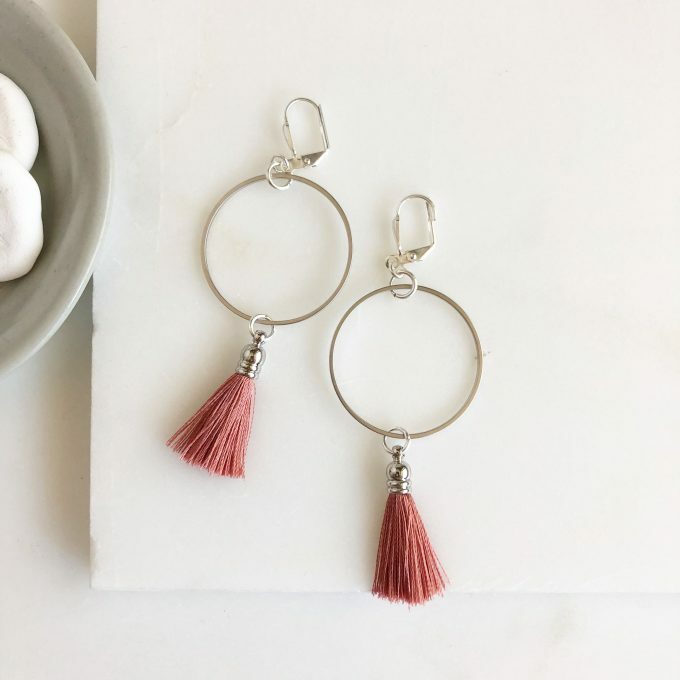 Next up: fan tassel earrings. These “fan out”, hence their name, and really pop! These tassels are 2″ wide and measure 1 inch long; earrings overall measure about 2.5-3″ long. 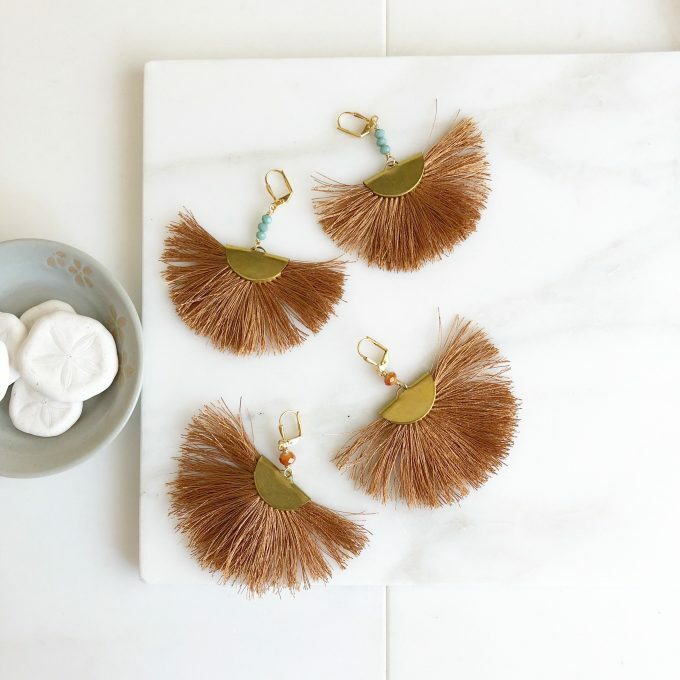 Copper is a HUGE trend — I love these copper tassels! These white tassel earrings would look beautiful for the bride! Love a little beaded fringe? These earrings are true beauties! 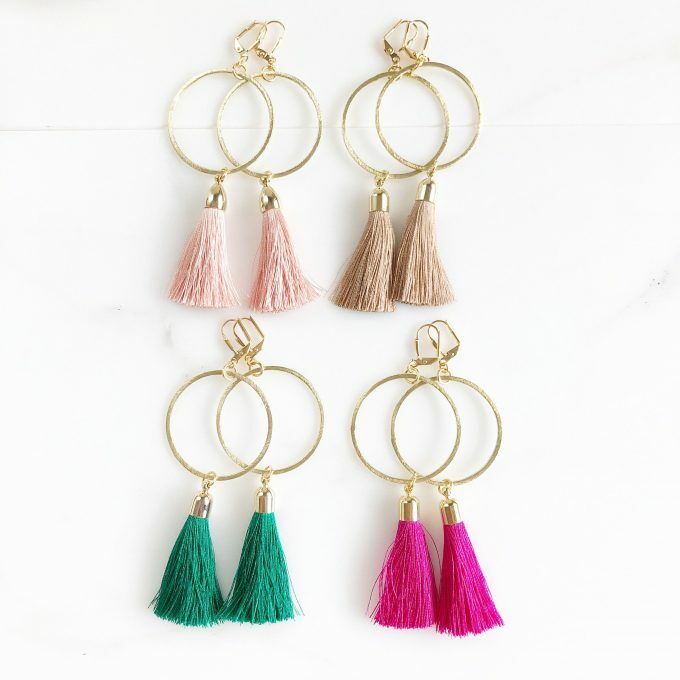 Ahhh, and there you have it; the prettiest tassel earrings online! Want to buy yours? You can shop here! These would make a sweet addition to a bridesmaid cosmetic bag. 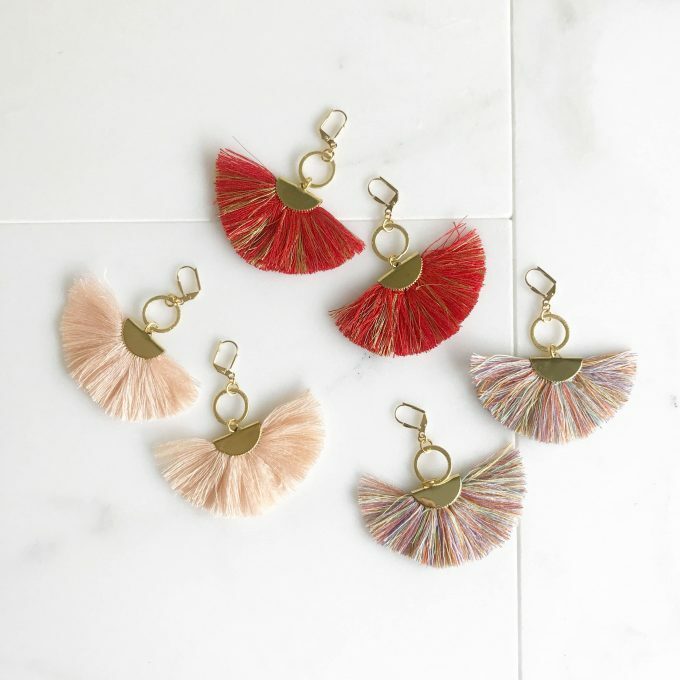 Which tassel earrings are your favorite? The turquoise? Hot pink? 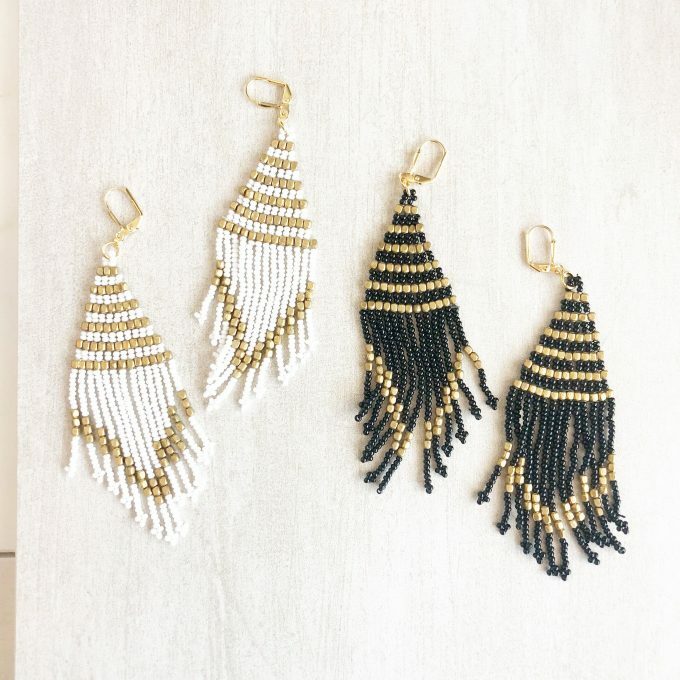 The long tassel earrings, or the beaded fringe? 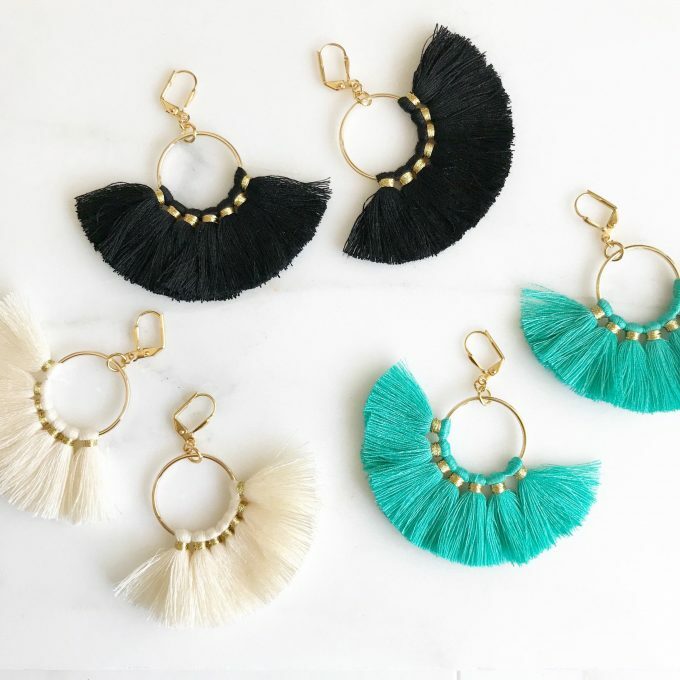 I love the hoop tassel earrings best; they really look great dressed up or down! Tell us your top picks in the comment box below.